Timothy D. Walker, author of Teach Like Finland, identified six strategies Finnish educators use to approach their work: seek flow, have a thicker skin, collaborate over coffee, welcome the experts, vacate on vacation, and don’t forget the joy. I wrote about the first three last week. Walker was not comfortable at first with welcoming colleagues or other experts into his classroom. After he visited other classrooms where he saw this modeled, he became a convert. Walker writes: “I found that the more I welcomed experts into my classroom, the more I began to view myself as a resource manager who could design great learning experiences for my class by tapping into talents outside my own” (183). School librarians have a long tradition of inviting guests into the library. We regularly invite authors, illustrators, scientists, politicians, and local experts of all kinds to share via the library program. (And it’s important to remember that all educators may not be as comfortable with this practice.) The very best of these presentations are directly aligned with classroom curricula and are coplanned and cofacilitated with classroom teachers and specialists. Two of the most successful expert presentations during my time at Sabino High School were visits by Arizona Daily Star editorial cartoonist David Fitzsimmons and our then Arizona State Representative Marian McClure. In both cases, I worked with the social studies classroom teachers to prepare students for their visits and to follow up afterward. Editorial cartoons became the topic for “questioning” reading comprehension strategy lessons. (See lesson 5-2 in Coteaching Reading Comprehension Strategies in Secondary School Libraries: Maximizing Your Impact.) In addition to civics information, the connection with Representative McClure provided advocacy for school librarianship at the state legislature. While school librarians are adept at bringing in outside experts, they may not be as experienced with using the human resources in the library and on campus. School staff and faculty have abundant expertise and talents to share. As school librarians build relationships in the school community, it is incumbent upon them to uncover the lights that are hiding under barrels in their own buildings—lights that could make a difference for students’ enthusiasm for curriculum-based learning as well as their pursuit of independent learning. In a recent Knowledge Quest blog post titled “Library as Incubator,” Mark Dzula wrote about how he supported the school library paraprofessional aide in sharing her language and culture expertise with students during a weekly lunchtime drop-in Arabic program. Mark wrote: “She was motivated to share her love of the language to help expand students’ worldview and to overcome any social stigma that the students may have encountered in association with Arabic.” A dozen students attended and were very inspired in various ways to pursue more information about Arabic language and culture. With support from the World Language Department, one student is taking an independent study in Arabic with the library assistant next year. According to Walker, Finnish teachers “literally” vacating during the summer. Shocking! This practice is in sharp contrast with the summer practices of most U.S. educators. In the summer, most teach summer school, work another job outside of education, or prepare for the next school year. (Some even time their pregnancies so they can give birth in the summer in order to return to the classroom in the fall.) Walker, who feels the “vacate on vacation” strategy is too extreme, says he prefers a hybrid approach. In the summer, he dedicates a “healthy chunk of time for disconnecting and a healthy chunk of time for professional development” (186). The pace of life for most U.S. educators is intense during the academic year. Relaxing during the summer (and regularly throughout the school year) seems to be the healthiest choice. Making time in the summer for extended periods of reflection can be an excellent use of one’s “free” time. Interspersing professional books with other types of reading (adult novels, YA literature, and school curriculum-oriented reading) is one strategy some school librarians use to find balance. Extending conference attendance to include touring new parts of the country or visiting with friends and relatives is another way to combine professional learning with personal interests. Some would suggest that regular technology holidays could also improve one’s ability to relax. In his book, Walker offers a summary of a study conducted by the Harvard Business School. The study involved two groups of consulting firm workers. One group worked 50+ hours per week. didn’t take vacation time and was always connected via their electronic devices. The other worked 40 hours per week, took vacations, and coordinated unconnected time with their coworkers so they could be disconnected without worry or guilt. The team that took time off reported higher job satisfaction, better work-life balance, increased learning, improved communication with their team, and were more efficient and productive in their work (187). By “vacating” the always “on” culture for selected days, weekends, or even months might also prioritize engaging in enriching face-to-face interactions with family, friends, neighbors, and even strangers. One thought-provoking book to consider on this subject is Reclaiming Conversation: The Power of Talk in the Digital Age by Sherry Turkle. She proclaims: “It’s time to put technology in its place and reclaim conversation. That journey begins with a better understanding of what conversation accomplishes and how technology can get in the way” (25). There is a palpable feeling of excitement in a joyful learning environment. I once served as the school librarian in a truly “joyful” preK-5 school. Our school was led by a joyful principal whose most often heard phrase was “what a wonder!” With a positive school climate and a commitment to a culture of collaboration, faculty, staff, and families made our school a joyful place to be—every day of the academic year (and in summer programs, too). Note: This photograph of our seven-month-old puppy Pearl playing with her friend Vicka captures (for me) the pure spirit of joy. 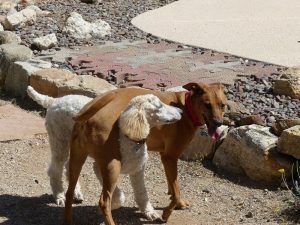 (Pearl is the poodle.) Every morning when we awake, she reminds us there is a truly joyful way to greet each day. Dzula, Mark. 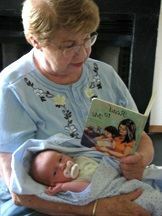 “Library as Incubator.” Knowledge Quest Blog. 18 May 2017. http://knowledgequest.aasl.org/library-as-incubator/ Accessed 26 May 2017. Moreillon, Judi. Coteaching Reading Comprehension Strategies in Secondary School Libraries: Maximizing Your Impact. Chicago: ALA Editions, 2012. 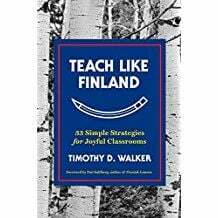 Walker, Timothy D. Teach Like Finland: 33 Simple Strategies for Joyful Classrooms. New York: W. W. Norton, 2016. While authoring my forthcoming book, I have read many professional books. This is the first in a series of professional book reviews–possible titles for your summer reading. The reviews are in no particular order. Since 2001, many educators in the U. S., including yours truly, and around the world have wondered why Finnish students continually rank as top scorers on the international PISA exam. I recently read Teach Like Finland: 33 Simple Strategies for Joyful Classrooms. This is some of what I learned. Before I even opened the book, I reflected on the use of the word “joyful” in the subtitle. In my work as a school librarian which included thirteen years at all three instructional levels between 1992 – 2009, I cotaught with classroom teachers in their classrooms as well as in the library, computer labs, and out in the field. I had the pleasure of working in many “joyful” classrooms, libraries, and even one very joyful school! There were many other aspects of the Finnish education culture that “spoke to me.” Children start formal schooling at age seven. Elementary schools, in particularly, strive for a holistic, child-focused curriculum that addresses all subjects evenly. All subjects including art and music as well as what U. S. schools consider “core” subjects get equal time. Finnish schools apply the research that has shown art contributes to innovative thinking and music knowledge can help learners grasp mathematical patterns. The holistic model gives children opportunities to cultivate multiple aspects of their personalities and talents. Walker identified six strategies Finnish educators use to approach their work: seek flow, have a thicker skin, collaborate over coffee, welcome the experts, vacate on vacation, and don’t forget the joy. All of these are well worth considering. As a writer and educator, I know and strive for that feeling of flow when my mind and body are totally focused and I do my best work. Walker writes: “Being teachers who seek flow, not superiority, is something that’s not just good for us; it’s also good for our students. Our students are watching us, and if they see that we’re seeking to do our best work, free of comparing ourselves to others, I’m confident that this kind of example will foster a noncompetitive culture in our classrooms… This positive change we want to see—as is so often the case in teaching—starts with us” (Walker 173). Having a “thicker skin” that allows us to give, receive, and respond to constructive criticism is another important strategy. Principal leader and author of The Innovator’s Mindset: Empower Learning, Unleash Talent, and Lead a Culture of Creativity George Couros just last week posted “It’s Okay to Be the ‘Boss’” to his blog. The thicker skin strategy totally aligns with Couros’s idea about providing adults with feedback. Walker goes on to write about how he uses journaling to work through anxieties and challenges in teaching. He also writes about how noting “gratitudes” can boost happiness and giving thanks can strengthen relationships. One of the most popular answers was collaboration! He noted that nearly 50% of the lessons he taught during his time in Finland were cotaught. “Teachers in my school were not just collaborating in the traditional sense, by planning and teaching lessons together—they were truly laboring together, sharing the burdens of teaching with each other. They were helping each other track down the resources they’d need for an upcoming lesson. They were discussing better ways to support needy students. They were analyzing curriculum together. They were talking about how to improve recess for the kids. They were grading tests together. They were offering tech support to each other. To my surprise, this work often happened in between sips of coffee, during those fifteen-minute breaks throughout the day” (Walker 178-179). His comment made me think about what I mean when I write about collaborating in the “traditional sense.” I believe coteaching involves all of the aspects that Walker describes, but maybe others, who have not experienced classroom-library coteaching between equal partners, do not perceive the same depth of partnership that I have experienced. In the course of coplanning and coteaching, classroom teachers and school librarians are analyzing curriculum together. They are sharing resources and providing technology support to one another. They are strategizing how to differentiate to meet the needs of all students. And in the most effective partnerships, they are assessing students’ work together and using assessment to adjust their instruction. Walker writes: “More than anything, I think collaboration is all about mind-set. If you truly believe that you are a better teacher when you are working in concert with others, then I think you will naturally find small, simple ways of collaborating… Their work together seemed like a by-product of their teaching mind-set” (181). Bravo! And yes! To a mind-set that believes collaboration is the key to better teaching. I will reflect on the other three strategies next week: welcome the experts, vacate on vacation, and don’t forget the joy. Couros, George. “It’s Okay to Be the ‘Boss.’” The Principal of Change blog. 18 May 2017, http://georgecouros.ca/blog/archives/7360 Accessed 20 May 2017. Raghunathan, Rag. If You’re So Smart, Why Aren’t You Happy? New York: Penguin, 2016. As a now “retired” educator and an advocate, I made a pledge to myself to spread the word about the expertise of school librarians in non-school library circles. I believe that school librarians’ potential to positively impact student learning outcomes has not yet been fully realized. Sharing and showing how school librarians can lead through building instructional partnerships with classroom teachers has long been my raison d’être. Last week, I stumbled upon the #cvtechtalk. Coincidentally, they were talking about “notetaking” – one of my all-time favorite topics. I share this experience here because one of the on-going issues in school librarianship advocacy is that other educators do not know what we can do to support their teaching and help their students learn effective information literacy strategies. Since this was a “tech” group, they shared many electronic tools for notemaking. 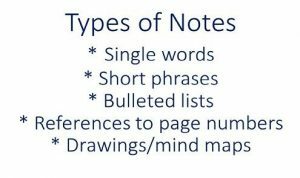 When one person noted she had read somewhere that hand-written notes were more effective, I shared a research-based article about the possible differences between handwritten and electronic notes in terms of student learning. The final question was perfect and one that I believe all Twitter chat groups should adopt. 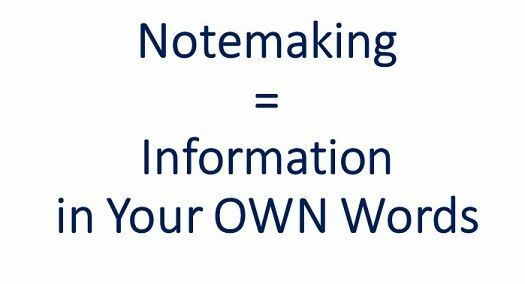 “Based on tonight’s talk, how will you empower students in note-taking?” (or whatever the topic). 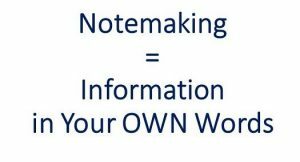 It was interesting to me that many educators noted they would NOT model notemaking strategies for students and were “anti-direct instruction” for this skill. I created a Storify archive of the chat’s final question for my review and for yours if you are interested. I know I will drop in on #cvtechtalk again when I can on Wednesday evenings at 7:00 p.m. Pacific (?). They are an active, caring, and sharing group of educators. I appreciate what I learned from listening and participating in their chat. If you are a school librarian who is participating in non-school librarian chats, I hope you will add a comment to this post. Readers may appreciate knowing what you perceive as the benefits or drawbacks of those professional learning experiences. Dedication: This post is “dedicated” to #txlchat. This chat’s home base is in Texas, but more and more school librarians from across the country are joining in. In 2014-2015, I had the opportunity to conduct a research study of #txlchat. Thanks to #txlchat moderators and participants, I was welcomed into their learning space and learned about the norms and benefits of their chat culture. I continue to connect and learn with #txlchat whenever I can get online on Tuesdays at 8:00 p.m. Central. Y’all are invited, too! I love spring! All of the clichés are true. Spring is the herald of new beginnings and new growth. Spring offers promises; it invites hope. Even in my Sonoran Desert home where the signs of the season can be a bit subtler than in lush green places, the spring blooms on the prickly pear and saguaro cacti are welcome sights to desert eyes. In spring, primary-age students noticed nature in a way they may have set aside over the winter months. Students looked to the sky and remarked on cloud formations. They observed the effects of rain on plants. They felt and welcomed the change to warmer temperatures. They captured insects on the playground. And most exciting for their teachers, they brought their questions about the natural world into the classroom and into the library. “Curiosity starts out as an impulse, an urge, but it pops out into the world as something more active, more searching: a question” (10). 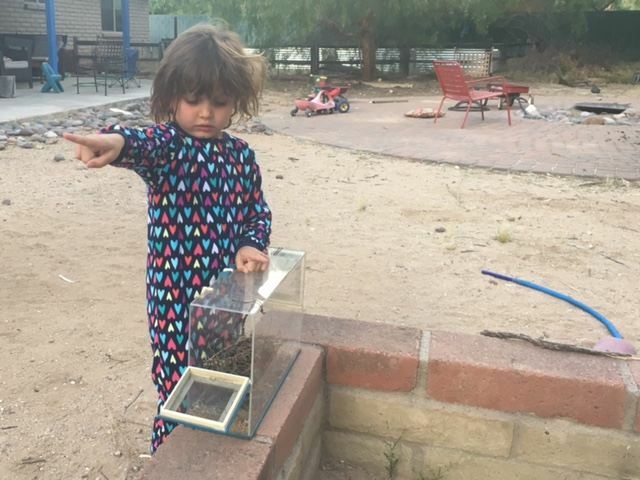 The image above shows a child observing the bright orange caterpillars he found in a neighbor’s yard. Why were they that color? Didn’t the color mean that birds would see and eat them? He learned to harvest the plants on which he found the caterpillars and wondered whether or not they needed water as well as food. 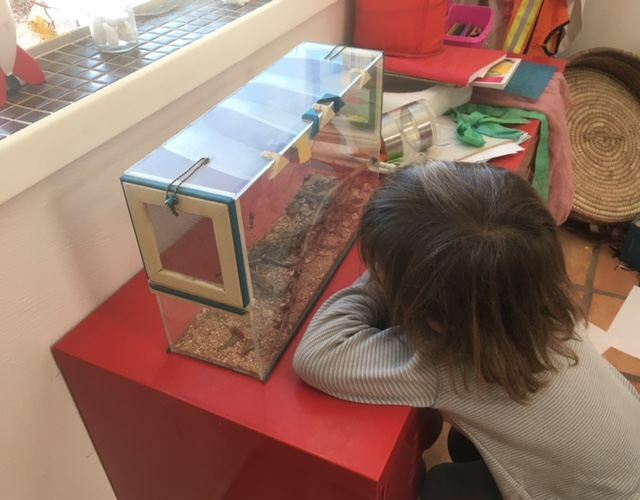 He learned about metamorphosis and asked questions about how these creatures would change their form. 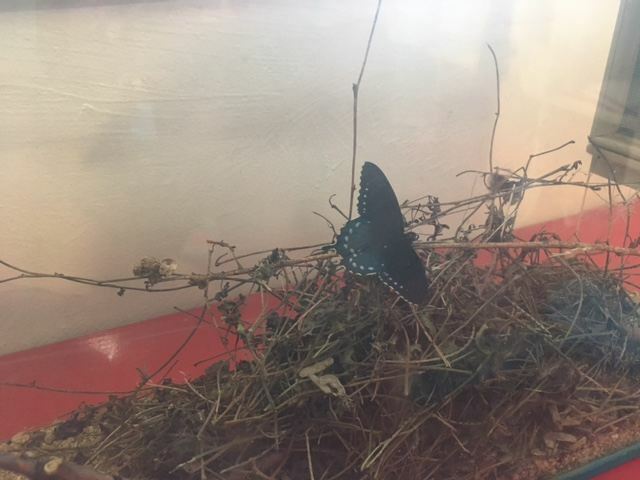 When he observed the chrysalis in the terrarium, he wondered if what he was seeing could possibly be what he had learned from asking questions. It wasn’t until the butterfly emerged that he believed this process was real. “Curiosity is a form a power, and also a form of courage” (15). Through curiosity and questioning, he was motivated to learn more. He experienced the power of change—both in the caterpillar and in his own understanding of metamorphosis. He also had the courage to do what he knew was “right.” He set the caterpillar turned butterfly free—free to be its transformed self. Students’ curiosity and questioning are the driving forces in inquiry learning. In some schools, student-led inquiry is practiced in primary grades only; in a few schools, it is practiced throughout the grades. In many schools, secondary students conduct traditional “research” projects that may not spring from students’ interests and as a result, fail to motivate and engage them. For some secondary students, their “senior project” may be their first K-12 learning experience prompted by their passion to pursue a personally meaningful question. It may be the first school-based learning experience that inspires them to take action in the world based on their new knowledge. When school librarians aspire to coteach empowered learners, we show respect for students’ minds. We show that we trust them to be curious, to ask questions, to seek answers, to learn, and to take action in the world. We believe in the power of knowledge to transform students and the world. Here’s to the opportunity spring affords us. Let’s see students’ learning and our instructional practice through fresh eyes. Let’s trust in the learning process—students’ and our own. Let’s be curious – together – and reach for a “bigger life”!